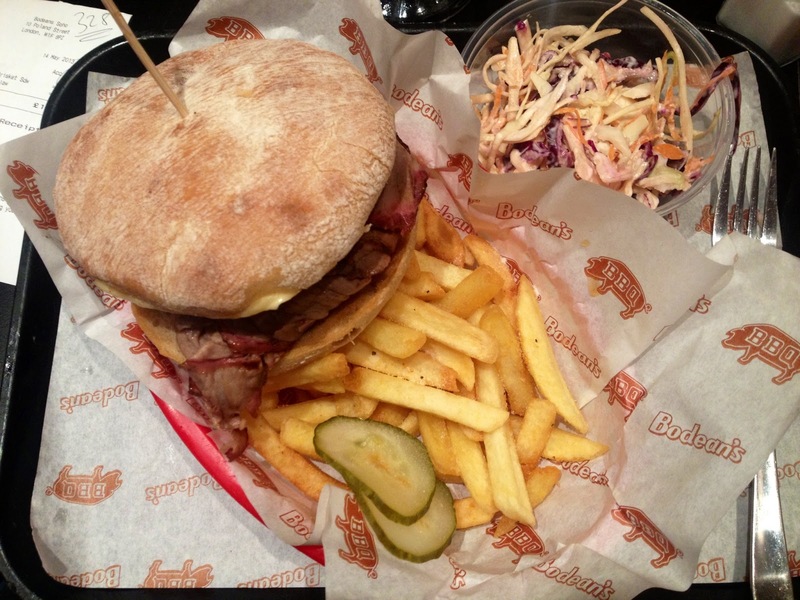 Bodean’s… Everyone’s favourite barbecue joint. It seemed as if the whole of my office had made it their go-to place for a blow out lunch and for ages I still had not tried it myself. So one rainy evening in Soho, having tried to eat somewhere else, been asked to re order twice because half the menu items were finished for the day (at 6:30pm?!) we eventually decided to spend our money elsewhere. When Bodean’s was suggested I jumped at the chance to tick another place off my list. Queues out the door on arrival could only be a sign of good things to come and we only had to wait around fifteen minutes to be seated in the diner area upstairs. In the meantime we tucked into two delicious milkshakes which can only be described as delightful… Who doesn’t love a good milkshake? Particularly when it’s so prettily decorated with a dusting of multicoloured sprinkles! Now, I know you’re supposed to have pulled pork in these barbecue places, but I’m not a massive pork fan so I opted instead for the KC Brisket Special: brisket beef topped with cheese and onion rings in a sourdough bun with fries and got myself a side of coleslaw. In the upstairs diner part of the restaurant a casual fast food concept has been adopted, with bench seating, diners go up to the counter to order their food and your number is called out when it’s ready. My generously sized meal arrived after a very short wait and I didn’t hesitate to dig in. The cheese in my bun was sort of melted onto the bread rather than onto the filling which I thought was a little odd. I didn’t think this would hinder the flavour, but perhaps there just wasn’t enough cheese as I couldn’t taste it much. The taste of the onion rings was also a bit lost so I pulled one out to try it on its own and it was a bit soggy and limp. It had had the life squashed out of it in the bun, they’d probably be better off served on the side. The amount of meat was seriously generous and quite tasty, making up slightly for the other disappointing elements. 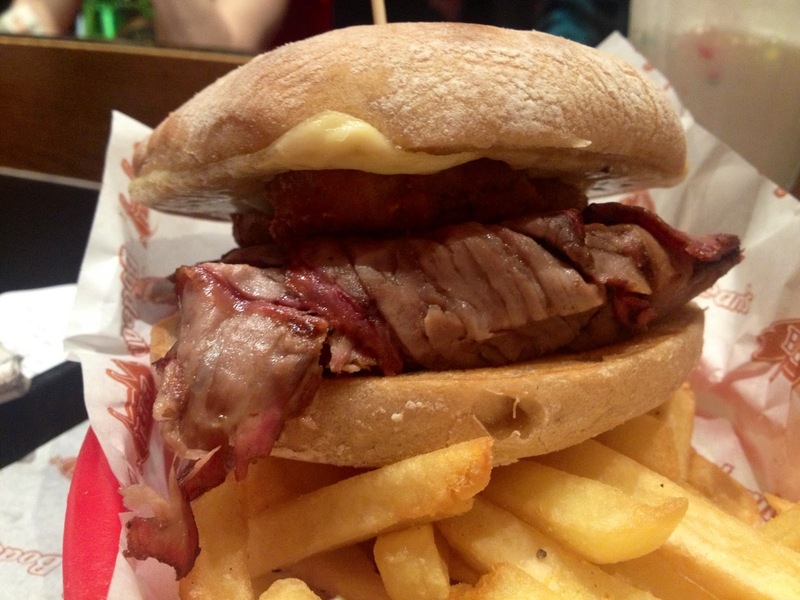 If I go again I’ll probably order something more meaty off the menu rather than going for a sandwich. The chips were okay, I’ve had a lot better and they could have been fresher. They resembled oven chips and lacked flavour but I guess they were fine. The coleslaw was also not great, it was a bit dry and seemed as though it was from a batch that had been made a day or two before, I wouldn’t bother getting it again. With the poor quality chips, lifeless coleslaw, sourdough bun and barely there melted cheese the overall effect was really dry. I’m not a huge fan of ketchup and I don’t believe that drowning food in it to add a bit of flavour and sauce actually improves the meal at all so I didn’t bother with this as a way to solve the dry issue. I am a fan of mayo, but there wasn’t any. Bodean’s left me feeling underwhelmed and generally a bit disappointed since it came so highly recommended from numerous friends and colleagues. I’m wondering if I’ve just missed the boat with this one and Bodean’s has had it’s glory day and perhaps now other similar places are stealing its crown? According to my colleagues though I just ordered badly and apparently I should have gone for the Soho Special. I am very confused about the difference between my experience and the feedback everyone else seems to give this place, so I will go back and give them a second chance. It won’t be in a hurry though, too many places to try on my list!